MEXICO CITY 09.12.2016 (El Pueblo en Línea) - Mexico is no stranger to UFO sightings before, during or after tremors or earthquakes, an extraordinary fact when considering that the presence of these objects during earth movements has been documented on video not only here, but in various parts of the world. An earthquake was recorded on 8 February 2010 at 18:47 hours in Mexico City with a magnitude of 5.9 on the Richter scale with an epicenter in the state of Oaxaca. At 16:00 hours, Alejandro Mandeur, located in the south of the city, photographed a yellow, lentil-shaped object from the rooftop of his workplace. The alleged flying saucer projects a shadow to its left. The image also gives us several points of reference such as buildings, houses and trees, with the Iztaccihuatl Volcano in the background. Another case that has made news worldwide was recorded on 22 May 2009, involving an earthquake measuring 5.7 on the Richter scale. It shook Central Mexico at 17:15 hours. This movement was recorded by the National Seismological Center as having its epicenter in Puebla. UFO hunter Pedro Hernández videotaped a UFO expelling orbs as it flew over Ciudad Satélite in the State of Mexico. Nearly 100 of these objects scattered all over the city. 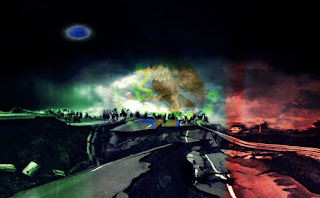 In the light of this evidence, we can conclude that there is a direct relationship between earthquakes and UFOs.